1. Employment (Title I) Business must provide reasonable accommodations to protect the rights of individuals with disabilities in all aspects of employment. Possible changes may include restructuring jobs, altering the layout of workstations, or modifying equipment. Employment aspects may include the application process, hiring, wages, benefits, and all other aspects of employment. Medical examinations are highly regulated. 2. Public Services (Title II) Public services, which include state and local government instrumentalities, the National Railroad Passenger Corporation, and other commuter authorities, cannot deny services to people with disabilities participation in programs or activities which are available to people without disabilities. In addition, public transportation systems, such as public transit buses, must be accessible to individuals with disabilities. 3. Public Accommodations (Title III) All new construction and modifications must be accessible to individuals with disabilities. For existing facilities, barriers to services must be removed if readily achievable. Public accommodations include facilities such as restaurants, hotels, grocery stores, retail stores, etc., as well as privately owned transportation systems. 4. Telecommunications (Title IV) Telecommunications companies offering telephone service to the general public must have telephone relay service to individuals who use telecommunication devices for the deaf (TTYs) or similar devices. 5. Miscellaneous (Title V) Includes a provision prohibiting either (a) coercing or threatening or (b) retaliating against the disabled or those attempting to aid people with disabilities in asserting their rights under the ADA. 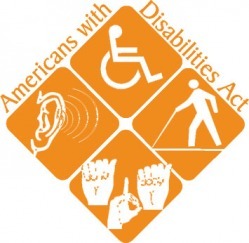 Other individuals who are protected in certain circumstances include 1) those, such as parents, who have an association with an individual known to have a disability, and 2) those who are coerced or subjected to retaliation for assisting people with disabilities in asserting their rights under the ADA. While the employment provisions of the ADA apply to employers of fifteen employees or more, its public accommodations provisions apply to all sizes of business, regardless of number of employees. State and local governments are covered regardless of size.